With another overnight bus ride under our belts, we arrived in Fethiye, a town located in the south of Turkey along the Mediterranean coast. 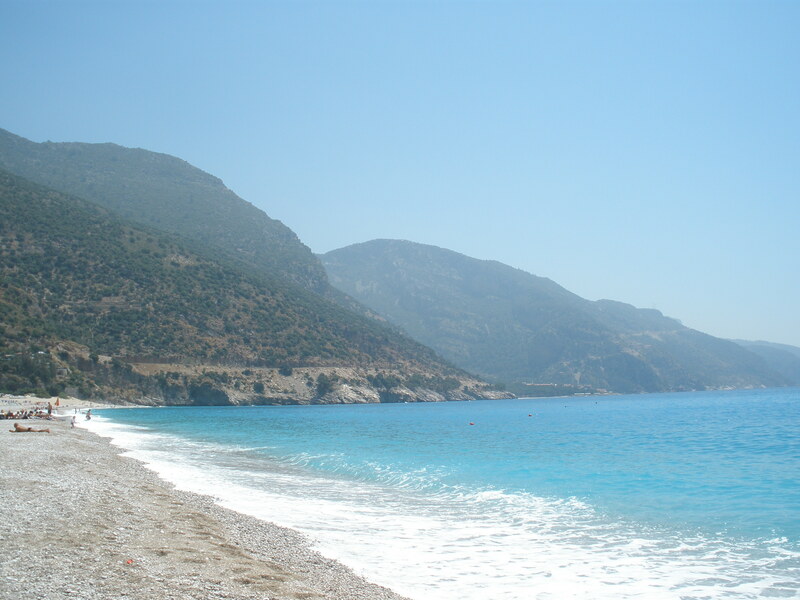 We would stay here a full day and night before catching our boat for a 4 night Blue Cruise along the coast over to Olympos. V-Go’s, our hostel in Fethiye, was super nice; they had a great swimming pool, wonderful staff, fantastic view of the bay, and hosted BBQ’s just about every night. 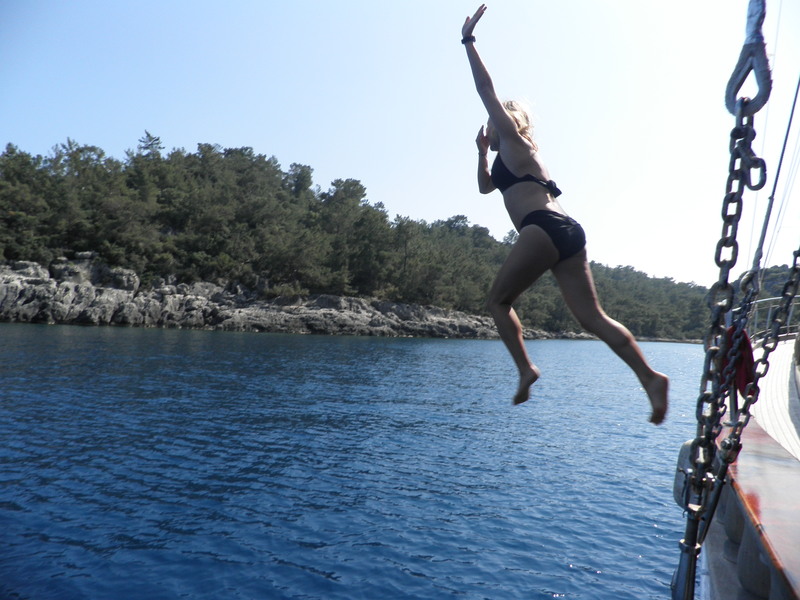 The first day we arrived we checked out the neighboring resort town of Oludeniz. We heard the beaches there were absolutey stunning (despite being full of European tourists) so we hopped on the local mini-bus and took a 20 minute ride to catch some rays. We spent the day lounging at a bean-bag beach bar, sipping beers and admiring the gorgeous water and surrounding cliffs. It’s also a hot spot for paragliding and “luckily” the landing strip was right behind us. Fortunatley, most landings were pretty good and no one ate it. 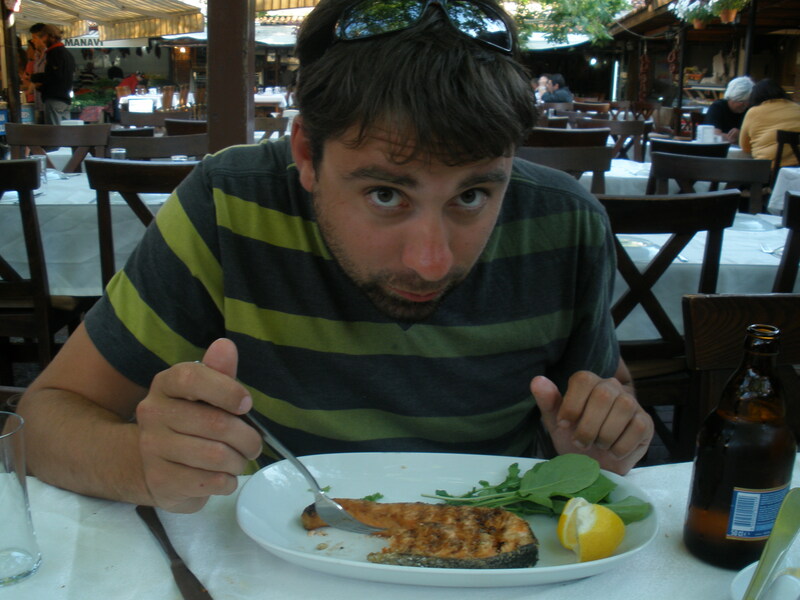 That evening for dinner, we visited the fish market in the center of Fethiye where you choose and pay for your fish, shrimp, etc. and then bring it over to one of the surrounding restaruants that will cook it up for you as desired and provide salad and bread for only $5! Talk about fresh! We all agreed that it had to be one of the best seafood meals we’d all had in our lives. I think Seth still dreams about that fish market! After dinner, Kim headed back to the hotel and Seth and I had some beers at the pier and caught up on what each of us had been up to over the last 7 or 8 months. We ended the evening having beers at V-Go with the staff and headed to bed. The next morning we were up and at em’ quite early to catch our bus to the bay where we would be shuttled out to the boat for our gullet cruise along the Mediterranean coast. We picked up a handful of people that would be joining us on the cruise and spent the short ride getting aquainted. 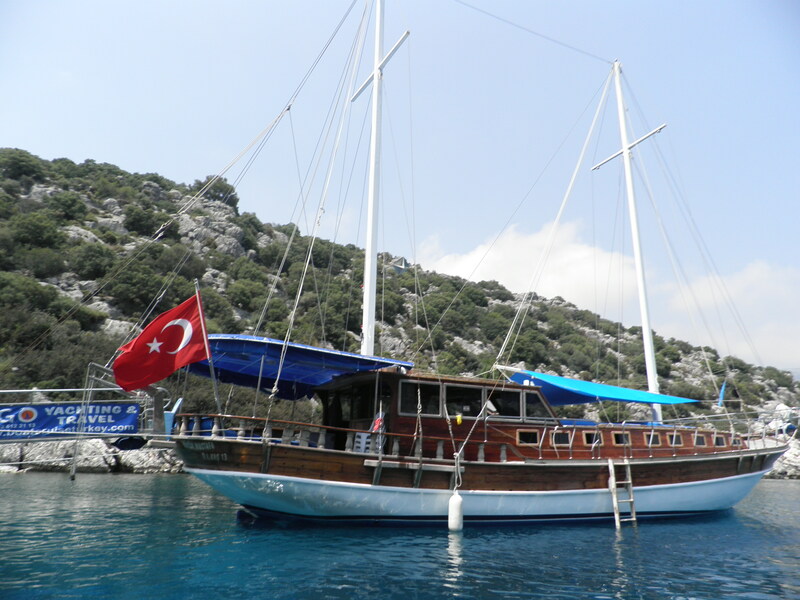 Once on the boat, we and met the other passengers and our captian, Ahmet, and headed out. Even though the ocean and landscape were incredibly beautiful, I had a little trouble that first day. I’m not sure if it was the quality of the Turkish motionsickness medicine or what, but I was seasick for the first 4 or 5 hours on the boat. Luckily, I found my sea legs later that afternoon and could relax and enjoy myself. For the next few days, all we did was lounge around, work on our tan, eat, drink, swim in the coldest water EVER and check out the scenery. I also learned how to play backgammon! We had perfect weather the whole time. Our first stop was the small town of Kas (pronounced “cash”) for a short walk around and some souvenier shopping. In the days that followed, we cruised by the former town of Dolikisthe, also known as the ‘Sunken City’, as it was ruined by an earthquake in the 2nd century. 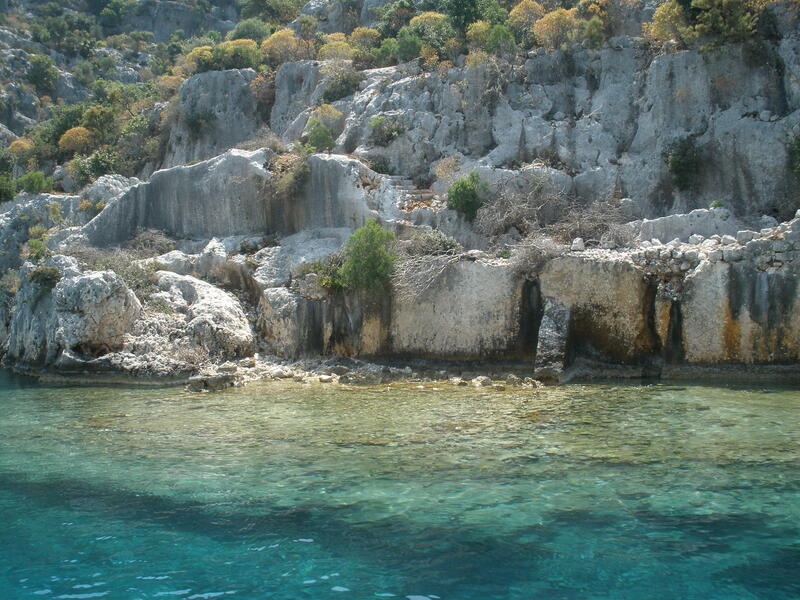 We were able to see one of the Greek Islands from the boat one day as well! The food that Ahmet and his mate prepared for us was delicious. Normally they have a cook that is on board but they were a little short staffed. I even helped out with dinner one night! Another evening, we docked the boat and the guys BBQed for everyone on a small island. 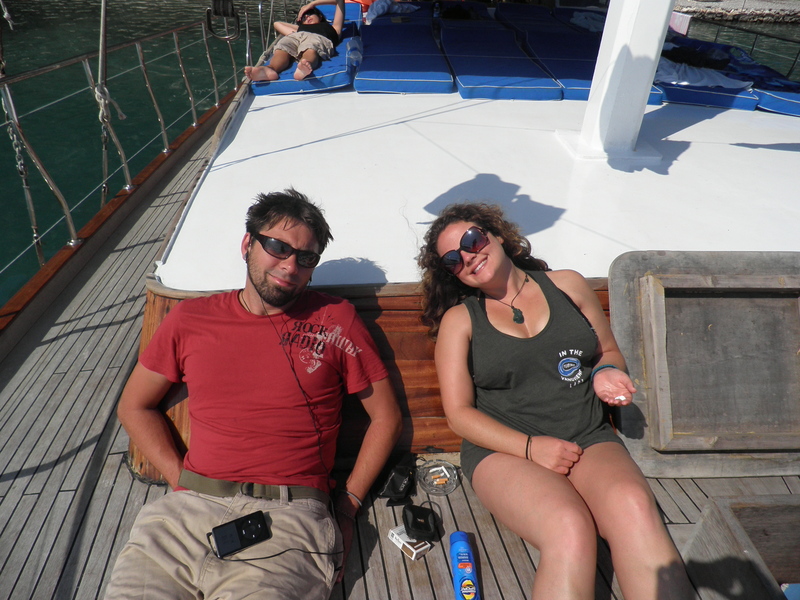 Seth, Kim and I spent every night sleeping on deck under the stars. It was awesome. We had such a great time and couldn’t have asked for a better cruise. 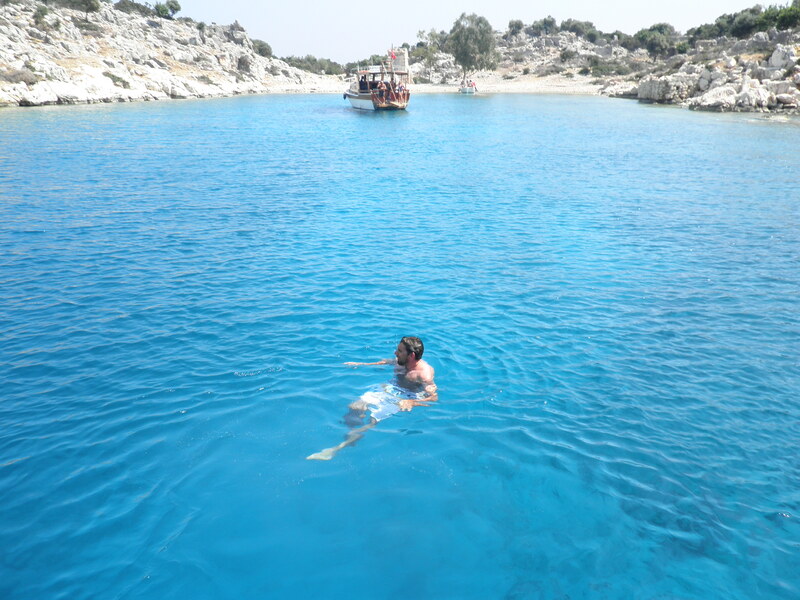 Great people, food, sights, Efes beer….it’s all you need! Our last night, we hung out in the bay near a town called Demre. 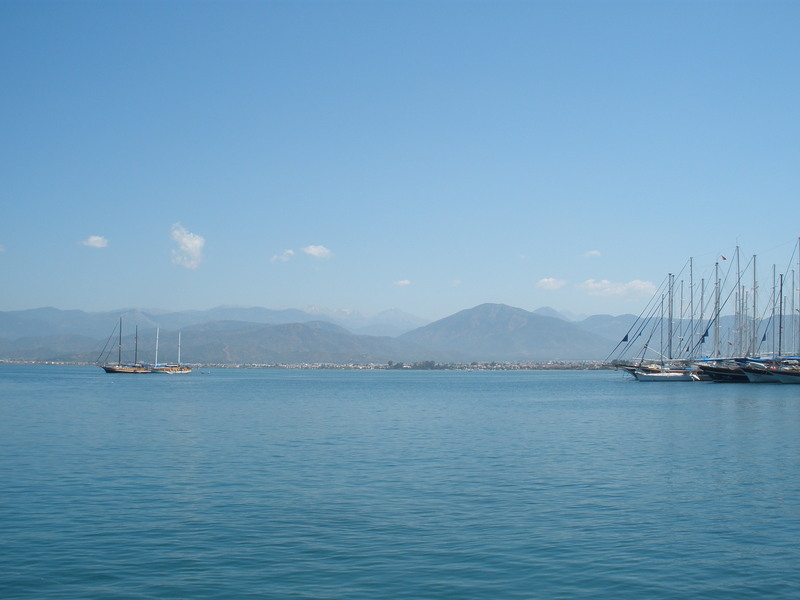 Our whole group would be shuttled to the dock the next afternoon to catch a mini-bus to Olympos. We all planned to stay Seth’s last night there in ‘tree houses’ next to more beach and old ruins. Can’t wait!